Trailer bikes are great for when they’re too big for balance bikes but not yet ready to be on their own. I was taught to bike the old-fashioned way. 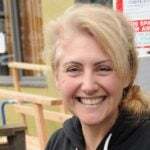 My mother tossed me and a little red bike off the end of the pier by our house and I pedaled with all my might for land — and I was a competent bicyclist by the time a wave swept me onto the sandy shore. Or something like that. Kids these days have it much easier with lots of nifty options that don’t involve the Pacific Ocean, avoid scraped elbows and knees, and aren’t uphill both ways. 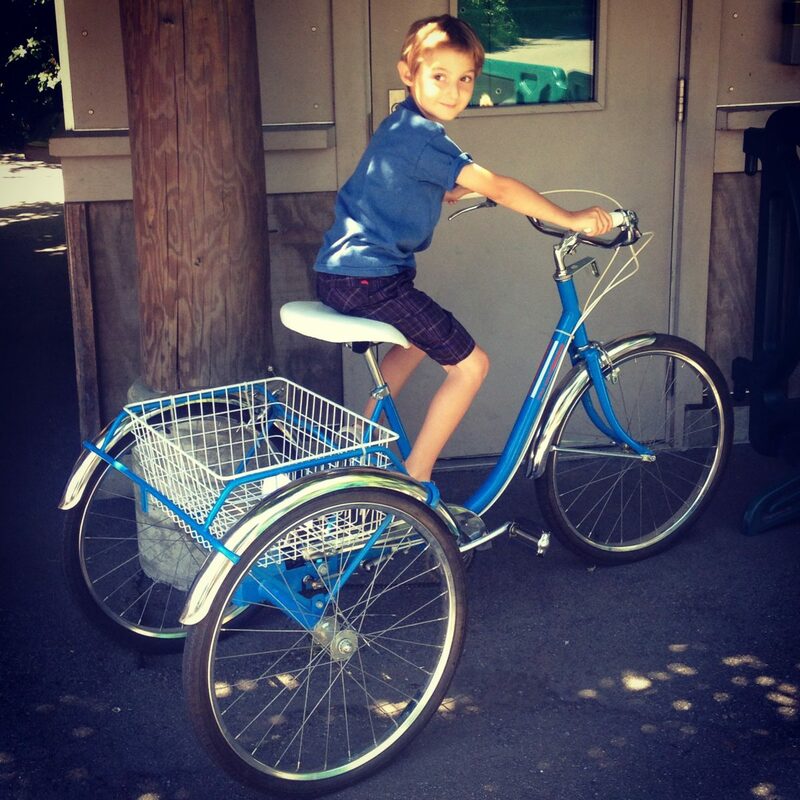 This week I’ll share what I’ve learned about balance bikes, tricycles and trailer bikes. Also called push bikes, run bikes, and b-bikes if you’re in a hurry, balance bikes are mini replicas of the world’s first prelude to a bike, the dandy horse, circa 1818. Cool then, cool now. Balance bikes come smaller than pedal bikes and allow kids to master balance before worrying about pedaling. They’re extremely fun and lots of kids like hanging onto their balance bikes for a while even once they’re pedaling proficiently. I’m of the mind that balance bikes are all pretty much the same, but there are some different features and a lot of different brands. Splash! I think some kids are better candidates for metal balance bikes. Metal balance bikes hold up better if left outdoors, but wooden bikes are lighter. I’m not sure that rule always applies, but when a friend borrowed our metal Kinderbike when he’d left his wooden Like-a-Bike at home, his mom noted it was heavier than she was used to. Which leads me to another great point about balance bikes: no protuberances in the middle of the bike make them incredibly easy to tuck into trailer cargo holds, messenger bags, panniers, etc, and bring along on bike rides. Some balance bikes come with a rear hand brake! Our two balance bikes — a KinderBike Mini and KinderBike Laufrad — both had hand brakes. Our kids never used them (hence my feeling that all balance bikes are pretty much the same); but in theory they’re a wonderful addition. Our balance bikes had air-filled tires I rarely needed to pump up (thank goodness because there’s little room for squeezing a pump nozzle in) and they lasted through two kids and lots of rough treatment each — but just barely. Our KinderBike Mini needed a new back tire when it was time to pass it along. For this reason many parents choose balance bikes with solid foam rubber tires. 10 years ago the KinderBike Mini was the smallest balance bike I could find. The only other option I was aware of back then was to get a wooden Skuut and assemble it with the frame upside down, though that was still a bit taller than the KinderBike Mini. 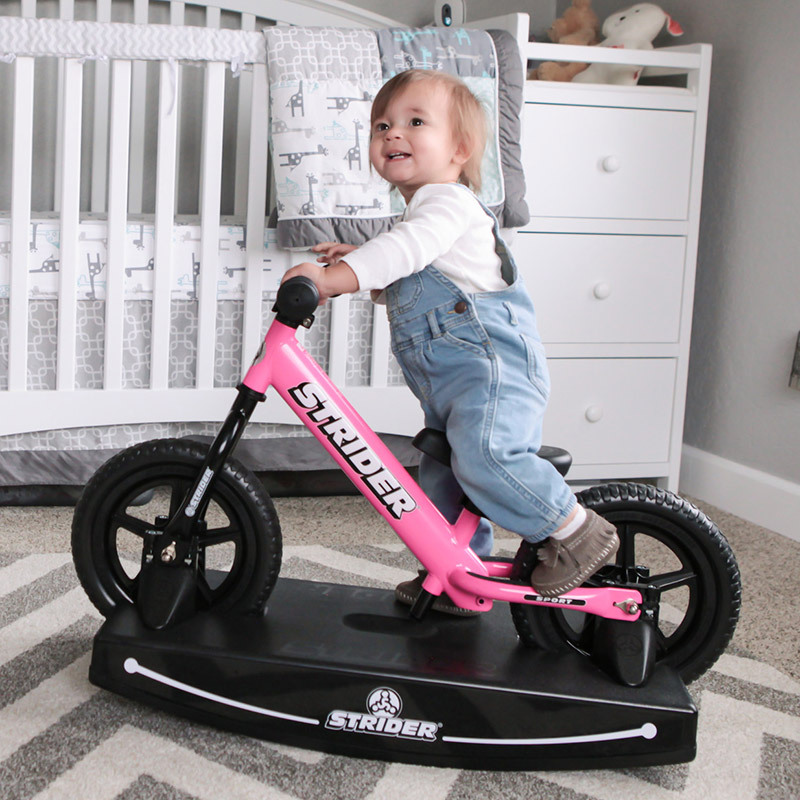 But these days there are many tiny options, including the smallest: the Strider Bike Baby Bundle (right) that includes a base and can fit toddlers as young as six months old! ➤ Can’t you just take the pedals off a regular bike? You sure can! 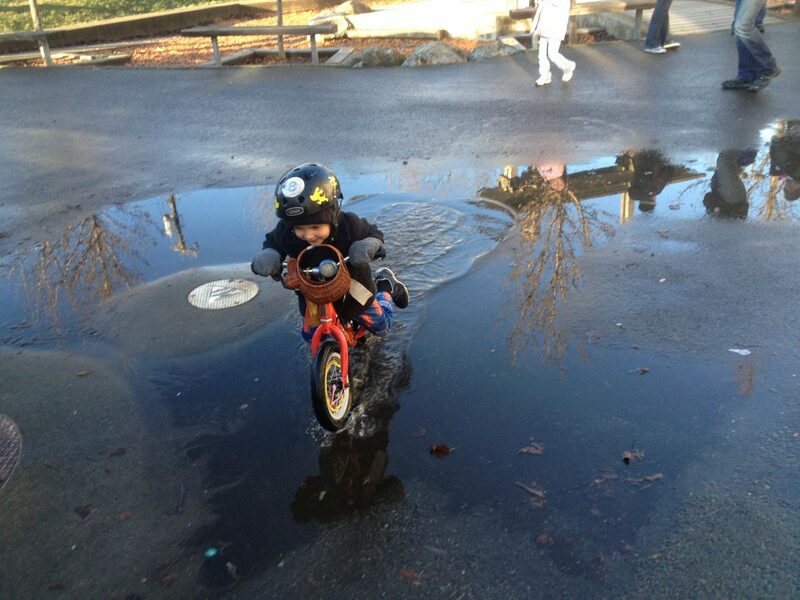 But most toddlers seem to start balance biking when they are still too small for the smallest pedal bike. However, taller kids can use a bike with pedals removed. 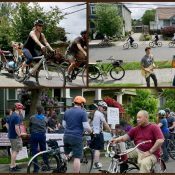 It’s also a wonderful way to get balance bikers used to the size and weight of their new pedal bikes — turn them into balance bikes temporarily before working on pedaling. Pedal removal is a quick task for your local bike shop or you can do it yourself with a pedal wrench. I have a $10 consumer quality pedal wrench and do pedal swapping myself, but old pedals can be extremely hard to remove (even when you know only the right pedal is rightly righty-tighty-lefty-loosy and the left pedal is opposite) and I abandoned my first solo pedal swap in tears. Generally just removing the pedals is fine and little legs won’t bang on crank arms, but you can also take out the whole bottom bracket if you’re so inclined. You can take pedals of a bigger bike as mentioned above, but that will probably be heavier than getting a big purpose-made balance bike. Strider has a special needs category of bikes including two bigger balance bikes, a 16-inch for ages six and up with a weight limit of 187 pounds and a 20-inch for ages 10 and up with a rider weight limit of 242 pounds. They both have front and rear hand brakes. Four-wheeled push toy (musical instrument not included, that’s just early cargo biking). Before they could shuffle around on two wheels, my kids loved shuffling around on four wheels thanks to the tiny Radio Flyer Scoot-About&#x2122; designed for ages one to three. There are lots of tiny things with three and four wheels that look a lot like balance bikes for toddlers eager to join the biking fun. An unattended cargo trike at the zoo is still a trike! Pedal-free pushing isn’t the only prelude to bicycling. Furthermore, while my kids got the balance part down pat, they had a bit of trouble getting used to pedals. So it’s nice to have some sort of pre-bike vehicle with pedals to introduce the concept. We tackled this by test-riding bikes with training wheels on the REI showroom floor. That said, there are plenty of success stories of balance bikers who zoom off into the sunset the moment they straddle their first pedal bikes. Ideally balance bike kids can skip training wheels altogether, but one neat thing I learned about training wheels while my kids attended a Pedalheads bike camp was that putting training wheels on bikes just after kids learn to pedal — and only for a day or a couple hours — allows kids time to figure out braking. If only I had known this when my younger son started pedaling because he loved going top speed yet had zero interest in using his brakes for several nerve-racking weeks. Our Burley Piccolo trailer bike adjusted pretty small. Also known as trail-a-bikes (after the popular Adams brand) and tag-alongs, trailer bikes are a great way to introduce pedaling while not having to focus on balance. You can also use them when you want to go faster than you’re able to with kids trying to keep up on their own. I don’t see a lot of kids actively pedaling when on trailer bikes (my own kids included), but they’re there for experimenting with. I’m sure I’m missing a lot of helpful items so please share in the comments any additional pre-bikes and not-quite-bikes you’ve found useful or seen in action. What’s your favorite starter-wheeled thing? For us it was the Kidztandem, funnest bike I have ever road and since my daughter was out front she became great at looking for traffic and since she had to pedal she built some endurance. Then kids were riding on their 16 inch wheeled bike no problem. 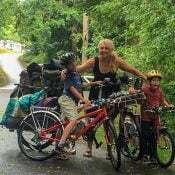 We started our kids on the back seat of a conventional tandem at age 2 1/2. We used a child stoker kit, extension handle bars, and the backrest with chest straps from an Adams Trail-a-Bike. At one point we had a Bike Friday tandem with low step-over height that the kids really liked. On the back of a tandem there was never any question about where they were and whether they were making bad decisions about their riding. We did lots of riding with them on the tandem, but it probably delayed their transition to their own bikes. Newer tandem designs with steeply sloped top tubes, such as the Co-Motion Periscope, offers the flexibility to accommodate an adult stoker or a youngster. The tandems worked great for us. Also forgot the rear rack seat. Think it was called a co-pilot. It worked well too. I love the starter combo of a balance bike and a tricycle. 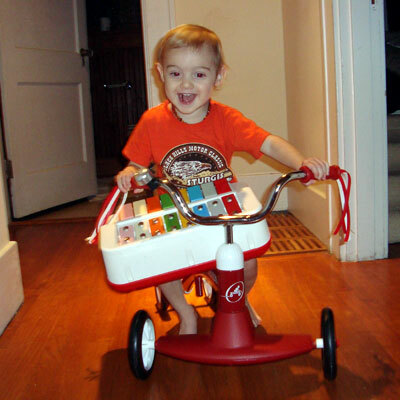 The balance bike for, well, balance and control and the trike for pedaling. I’ve seen a few different kids have great results with this combo from around 2-4. 1. Got a used Islabikes Rothan at age 2. Lightweight, air tires, friendly geometry, and a rear hand brake. By 2 1/2 she was flying all over the place, and I started teaching her to coast with her feet up and use the hand break. A good balance bike makes everything easier. 2. Tricycle/bike trainer. To add in the pedaling element, we borrowed a tricycle and had her use that for a few weeks. I bought her first pedal bike a few months early and loaded it on a stationary trainer so she could practice pedaling. 3. First pedal bike: 14″ tire size. I found one that had been converted to Freewheel, so she wouldn’t learn a coaster brake just to unlearn it later. We spent a few sessions with the pedals off, and then with a little help she was able to put it all together. Persistence is key. We would go to the park and practice 2-3 times per week. Think is easier if your kid enjoys it, so we were definitely lucky there. My kid had a balance bike, but didn’t use it much. They preferred riding in the trailer and having me do all the work. But they eventually outgrew it and got on a Trail-A-Bike. They also had a drift trike. They only used those 4-wheel scooter things a couple times at friend’s houses, but enjoyed it. Once a real bike was needed I saved for an Islabikes. Ooh, kiddie drift trike as pre-bike sounds fun! That worked well for us and was our go-to bike for in-town stuff. 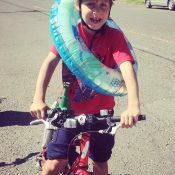 It also made him very comfortable on bikes so that he was a terror on the bike polo field at age five. (Old-school bike polo on grass, not the game played today). Fast forward a few decades and my granddaughters have done things differently. They started on velocipedes and then moved on to being tandem stokers, then on to trailer bikes followed by riding their own bikes. I was proud of the four miles per day my four- and five-year-old granddaughters ride until I met a man on a trip to California. He recently purchased a Co-Motion Periscope and his five-year-old daughter loves it. She rode 100 miles in the first week! She rides on it to pre-school, over 30 miles round-trip. I met him on the road without her and saw them riding twogether the next morning. Truly awe inspiring wonderfulness that we need more of. Wait!!! Is “twogether” a cute tandem term?? If not, it should be. Oh, hi! 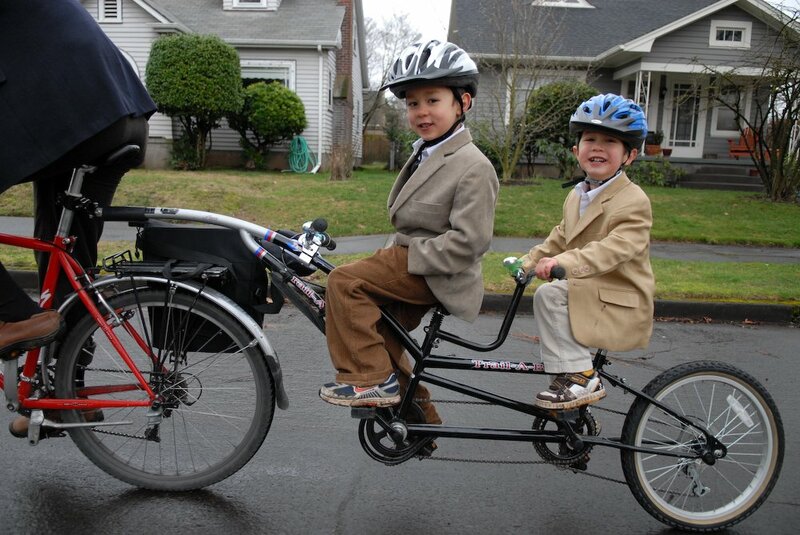 Those are my boys in the photo on the tandem. 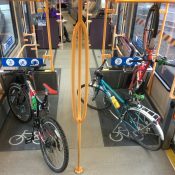 They are now 15 and 13, respectively, and travel all around Portland by bike and TriMet. They also will pick up their 9 yr old brother from school and other activities. It’s amazing if you start them out young, it will help them grow into independent kids. My kids did not ride the tandem for very long, perhaps even less than a year. They transitioned quickly from balance bike to trail-a-bike to on their own quickly. Kids are fast learners. You just need to ride often and in safe situations!